In my previous post on vectorising raster NMP tiles, I concluded that for certain purposes it would be more analytically useful to create a version that consisted of lines rather than polygons (in order to attempt to look at the topology of field systems in particular). 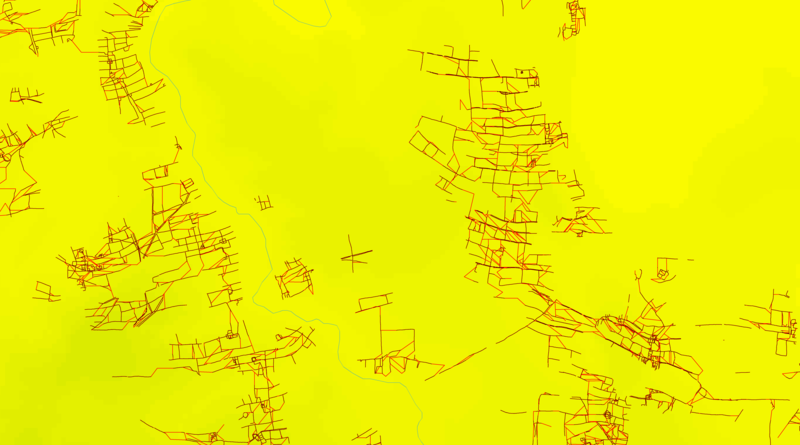 I said that I would look into using the Thin algorithm in GRASS GIS, but I then noticed that ArcGIS also has a Thin tool, so I decided to play with that instead! 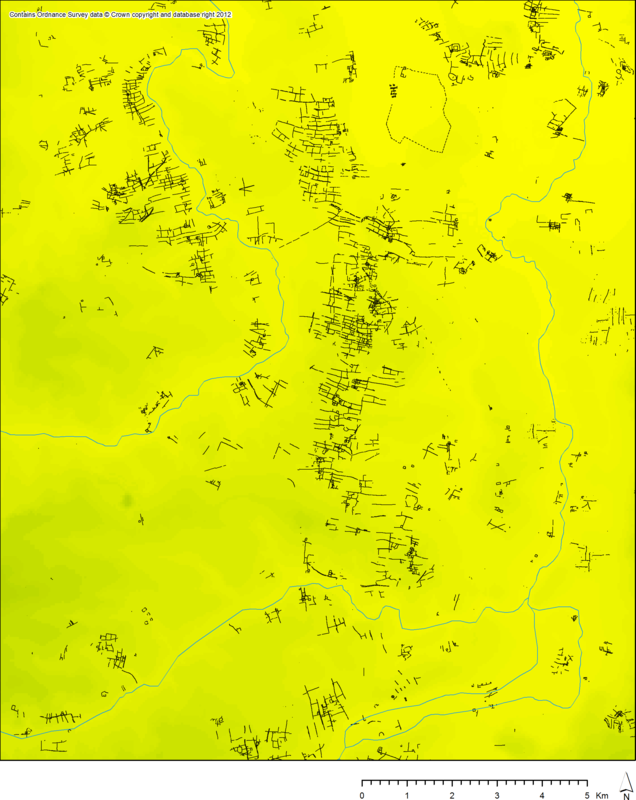 Line version of vectorised raster NMP (brickwork fields in Nottinghamshire). However, the results are significantly more problematic than when converting to polygons. As an example, areas of rig and furrow are represented in the raster NMP drawings as dotted outlines with arrows showing the direction of the furrows. These show up fine in the polygon version, but the dotted outlines disappear in the line version. * Yet the arrows remain. Therefore, if studying the line version in isolation, there is no way to tell that the lines representing the arrows were once arrows and are not drawings of archaeological features. Something similar happens with text on the maps. Comparison of line (red) and polygon (grey / black) vectorised versions of raster NMP: note the disappearance in the line version of the dotted outlines of rig and furrow areas. The rather messy result of trying to automate filling gaps in lines (originals in black, extensions in red). As such, if I am to use this data to study the topology of field systems, I will have to make all these edits manually: to eliminate small gaps in continuous features and to remove features that are not themselves part of the field systems. I will experiment with this and report again at a later date. * Incidentally, although this result is problematic for most purposes, it may provide a route into converting these areas defined by dotted outlines into polygons covering the extent of the enclosed area, by creating buffers around the line result and erasing the buffered areas from the polygon result (and then processing this somehow into filled polygons: I’m not sure how! ), but that is something that will require a lot more thought / experimentation. Next Next post: Almost there with data collecting!